The day started like I want any day to start. Wake up whenever I wake up. Get up whenever I get up. Eat whenever I eat and leave whenever I leave. I left at about 1:00 by myself. I went to an area just near where the house boat is and it looks like a navy base of some sort. Kat had recommended going in to have a look around. I was a bit wary about going in because it did look very official but there was no one stopping me walking in so I just…did. Kat had said there wasn’t actually much to see in there except for a submarine and a big ship. It wasn’t hard to find the sub as it was out of the water. I took some photos and turned around and there was the battleship. Well, it was not quite a full scale battleship but it was still a big boat. When I had my fill of navy stuff, I went back out and met up with Kat who was a little later getting ready. We then started walking towards the city. We went to an area that everyone here talks about all the time. 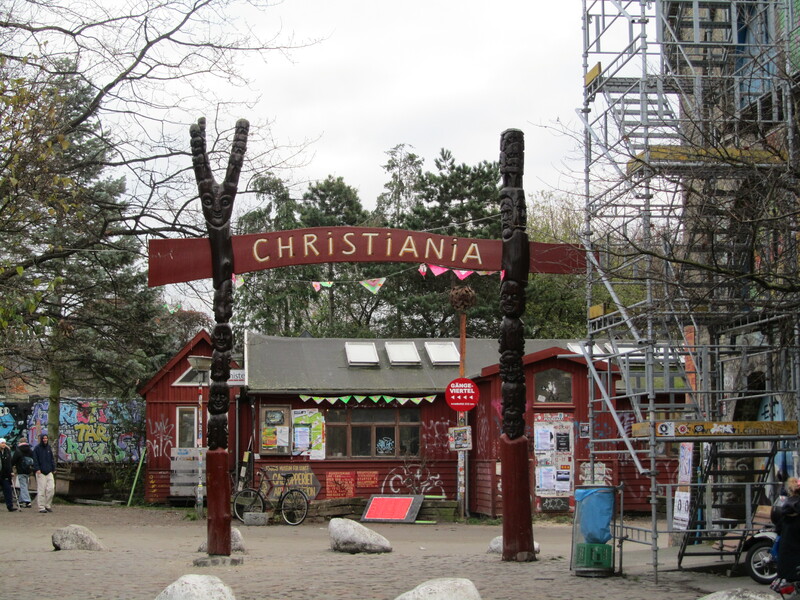 It’s called Christiania and it proclaims itself as a free state outside of Danish rule. I had never heard of it until I got to Norway when lots of people started telling me about it. It is well know because they sell marijuana openly there. Basically how the place started was, in the seventies, some hippies started squatting in some old, abandoned barracks. As the numbers grew, they started simply making up their own rules and not paying taxes and stuff like that. The government have tried to kick them out several times but they always come back. They started building their own buildings and now it is a thriving little town that is pretty much lives by its own rules. The government is stuck because it is a big tourist attraction but it sets a bad example and they sell marijuana on the street, in little stalls. They have some strict rules about no photography in what is known as the green light district, (that is the only place marijuana can be sold) no harder drugs, no guns, no bulletproof armor, no stolen goods, no fireworks, no ‘thunderflashes’, no bikers colours, no cars and no violence at all. The centre is full of places that sell food from organic sources as well as bars that all have their own theme but are usually really laid back and relaxed. They have no laws on constructions so people build houses however it suits them, even if it might not comply with a ‘building code’ (They still look like they are standing pretty safe to me) and, technically, no one owns any of the buildings so anyone can walk into a building without trespassing but that rule isn’t abused at all. All in all, I was really excited to check this place out. See what it was like. We entered in the ‘main’ entrance which has got a sign with the flag on it and telling you that you are entering Christiania and then on the other side, facing out, it says that you are now entering the EU. 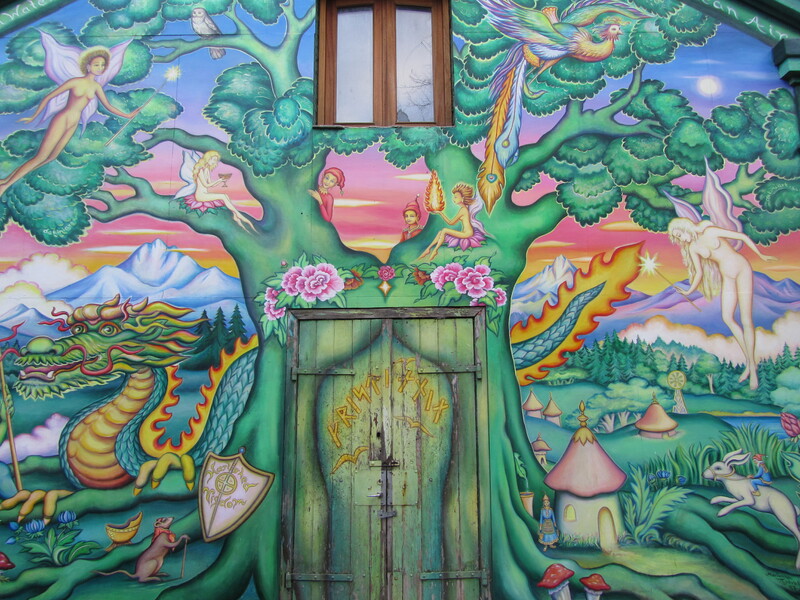 We looked at a few different things including a large mural that was put up not long after they arrived in Christiania. We walked through a kind of market area, got some great falafel, had a look at a bunch of the different bars the have and then into the green light district. The whole atmosphere was really interesting. Despite the emphasis on drugs for the outsiders, I felt very safe. None of the ground was concrete or tarmac and there was about 4 or 5 of these little stalls set up selling their ‘goods’. We walked through and out the other side unharmed. I make it sound like it is dangerous when it really isn’t at all. Probably feel safer there than anywhere else in a major city. We then walked out into the ‘suburbs’ and that was just a totally different experience. I think the way I can describe it is it was like being in a farm village in medieval times. All the houses built by the locals in whatever way they wanted. Mostly wooden houses which gave it a real farm atmosphere with people and their animals just going about their daily business. They even had a pony club thing setup. We walked around, just looking at…everything. It really felt like taking a small step back in time but with modern machinery to remind us where we actually were. There was still plenty of nature around as well. 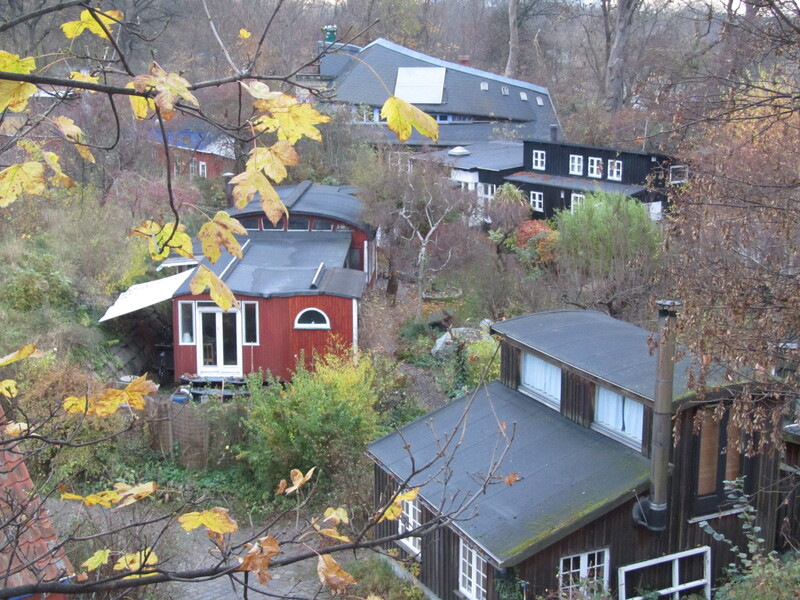 It sits right on a river so we walked up an embankment that looks over the river and walked along it for a bit until we found something of a treehouse that we went up and could look over all of Christiania. I kind of envy these people a lot in ways. I think the way of life and what they are doing is great. I cannot see how they are hurting anyone so I don’t understand how the government cannot understand that this is a good thing. I was reading a thing in Wiki (so therefore gospel truth) about Christiania and about how when the cops did a drug bust in the town, all the ‘pushers’ fled with their goods and sold it out on the street at higher prices. They also started up more places where people could buy weed but at the same time with other hard drugs as well. The way I see it, the cops dropped the sausage from the pan into the fire and made the situation much worse than it was. Anyway, I rant a little. What I was going to say about living there was that I do admire what they are doing and that if anything, it can be an example of how the rest of society could live but on the other hand, I don’t think I really could (live there). I am not really sure why. I think it might be the fact that they do have a small amount of gang activity creep in occasionally and it might be the fact that I would feel pressured to live up to their standards. I don’t know. Or it might be because it is so touristy that it just makes me sick after a while. We found a bridge that went over to the other side of the river. Over the other side was just as cool if not better. It was only ‘suburbs’ but because it was so far away from the green light district, it was far more…real. We walked through this area for a while before heading back all the way through to where we started. I had been talking over the last couple of days, including at the Couchsurfing meeting, to Morten (who was the guy that couldn’t host me) and he had invited us over to his house for dinner. Kat had her bike and so she went directly to Mortens place while I had to catch a train. She still beat me… Stupid public transport… We met up at the train station and walked to Mortens from there. When we arrived, we looked around his place which he only moved into 5 weeks before and then went out to get some food from the supermarket. When we arrived, we decided on burgers 🙂 We bought our mince and all the stuff to go in the burgers and went back to the house..large apartment. Kat was chopping chef, I was meat chef and Morten was… what was Morten doing? I guess he was lazy chef. When we had it all cooked up, Kat put burgers together and we sat down. We had a couple of bottles of red that we drank while preparing our dinner and during and when we finished as well. We all really enjoyed the food and were having a good time but then Kat decided she had to go in the hope she would do some work before going to bed. I just had to make sure I could catch the last bus home. I left a bit earlier than what I probably needed to only because I wasn’t sure when that last bus would arrive. When I arrived home, I found Kat had done nothing that she said she would but that didn’t really matter. It was a great day/night. Really made up for the day before. Glad today was better than yesterday. You do seem to get yourself into some situations, don’t you? Wouldn’t do it if I didn’t enjoy it.